Whether you’re refinishing cabinets or dressers when it’s time to look for drawer pulls and knobs the cost of refinishing skyrockets. Let’s face it. Handles are expensive! The average drawer pulls depending on the size and type of material can range from $3 to $13. Normally the really nice ones are at least $6 a piece. These days you can make handles out of just about anything from rope to old toys to copper pipes. And truth be told I considered copper pipes, that is until I made a trip down to Lowe’s and saw the cost of copper. A 1 foot 3/4″ diameter pipe is $11! So I had to reevaluate my process. 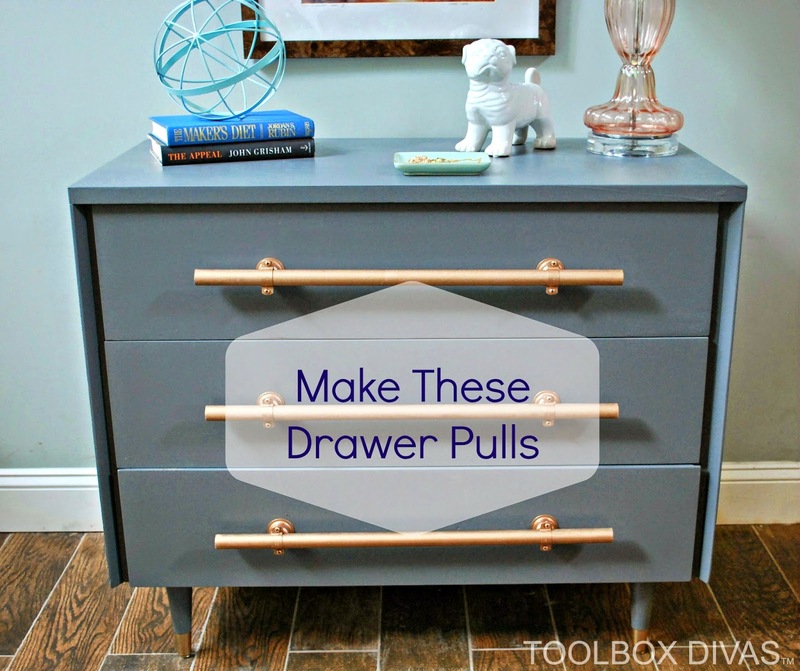 I’m going to show you how to get the look and feel of the expensive drawer pulls for a fraction of the cost. First mark on the drawer where the holes will be drilled for the drawer pulls to ensure the pulls are installed evenly on each drawer. Cut the wood dowels down to 2′ each. This can be done with a miter saw or a simple hand saw. Once the dowels are cut lay the pieces out and the bell hangers out on some plastic and spray evenly with your choice of metallic paint spray. For these I used Vintage Rose Gold by Rust-OLeum. Be sure to spray out in the open or in a space with good ventilation. Also I recommend wearing gloves. Spray paint can get messy. Allow the pieces 20 minutes or so to dry. Spray paint dries quickly. Now install the bell hangers to the drawers using 1 1/4″ construction screws. I like construction screws because it eliminates the need to pre-drill holes. Unclamp the bell hanger and place the dowel in the center. It works best when the bell hangers close vertically like shown in the picture. The dowel will extend evenly on each side of the bell hang. In this case, the dowel extends 4 inches on either side of the bell hanger. Make sure the sides are even before tightening the screws to secure the dowel. A carpenter’s square is helpful in ensuring the dowels are all installed evenly from drawer to drawer. In addition, I used a small piece of wood (1×2) to further ensure the handles are lined up perfectly. Once its all installed you are done. This can be done on any piece of furniture or cabinets. Using chrome or stainless steel metallic paint can give the look of sleek expensive door pulls on cabinets. No one would ever be the wiser. You achieved the look for less. 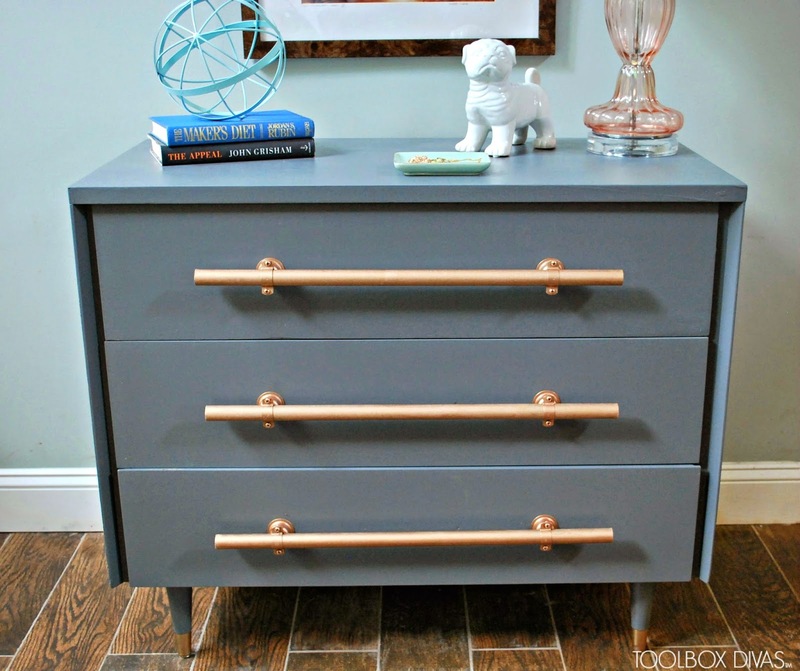 Check out the complete dresser transformation. the handles R BRILLIANT! THX 4 the tip! Thank you so much Cheryl! I now use wooden dowels in all my projects and love I can make it any color or size for a relatively low cost. What a great idea! I’m considering painting my kitchen cabinets a shade of white and want to do a nickel/brushed nickel spray for the knobs. Can you recommend a color of spray paint? I get in the store and just feel overwhelmed by the variety, and walk out with nothing. I’ve been doing this for about 8 mos.! I lose my motivation in the paint aisle every time! It turned out beautiful…. love the creativity! Oh my gosh!! I’ve been wanting a long handle for my bathroom for ages! But the size I want is special order at Lowes. And expensive to boot! Now I see this and think DOH! WHY DIDNT I THINK OF THAT???!!! Haha! Off to lowes AGAIN!!………. AWESOME!! I love using dowels as handles. It’s my go to. Please share photos. I’d love to see it. These are so incredibly brilliant! I may have to use them in a project soon. Thank you for the awesome tutorial! Hey Marianne! Thank you so much! I can’t wait to see how you use this trick on your next project.